Christmas is just over a month away and everyone is starting to think about buying the perfect Christmas present for their loved ones. What is the perfect gift anyway? I think it is a present that the receiver can use and treasure for years to come. It’s often hard to think of what that could be. We know that after Christmas many people are busy returning presents that don’t fit or aren’t appropriate. I have a suggestion for making the whole thing a lot easier. 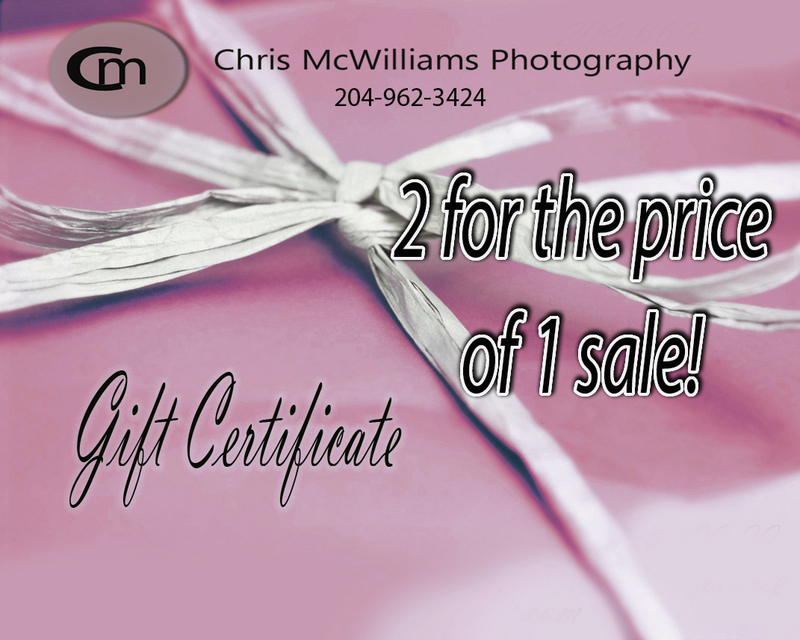 Get a photography gift certificate! A gift certificate for a photography session is one gift that is always appreciated. It is one that will be treasured for years to come and won’t be returned on Boxing Day. It not only creates memories but keeps them. If you’ve already had a photography session this year, then why not buy one of a number of different photo products that are available. Some of them are listed below but this list is not exclusive. Let me know if you have some pictures that you would like to use for photo gifts but need your galleries relisted. I can do that for you. It’s very easy to order a photo gift from my website. Let me know if you need any help or if you would like your gallery relisted. Then just pick your image, your product and pay for it. In no time at all, it will be delivered right to your door! Do you like to shop? I do but I don’t like crowds and I hate driving in bumper to bumper traffic. I get hot and impatient when waiting in lines or when I can’t find what I’m looking for. I had to ask 2 clerks at Superstore today before someone found the stuffing mix for me. It makes me crazy. For me the perfect way to shop is online. I love buying things from the comfort of my livingroom and having someone bring it to my door. There is someone magical about getting packages in the mail. Gift certificates also make great gifts ideas. Last year I bought my boyfriend a gift certificate for Thermea and we enjoyed a lovely day at the spa. Another time, I bought tickets for the Prairie Dog Central. That was a huge hit! I think buying someone an experience that you can share with them is a perfect gift. Having said all that, why not a gift certificate for a photo session? I can personalize one for you and send it to you by email. You can pay me with Paypal or Interact bank transfer and never leave the comfort of your home. And what a great gift for a young family who might otherwise not prioritize spending money on a session. I’ve sold quite a few of them and I know they are always appreciated. Send me an email with your details and I can get one to you asap! It’s that easy! What is the perfect Christmas present? I’m sure that a lot of us are asking this question right now What can I give to a special someone that will be appreciated and treasured. 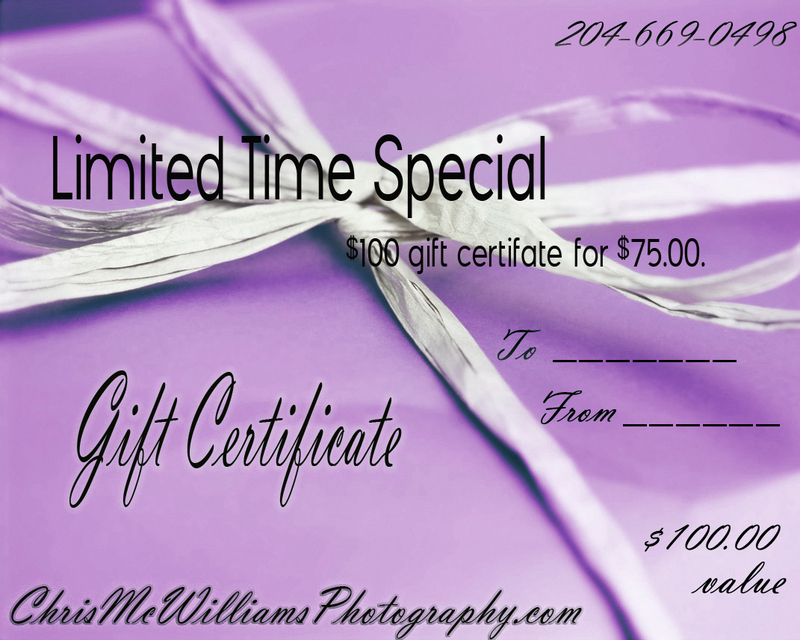 I think that buying someone a gift certificate for a photography session is as perfect a gift as you can get. Many people with small children cannot afford to get a professional portrait done of their child or their family. It’s a gift that will be treasured for years to come as the receiver looks at the photos and remembers that time in their lives. I offer gift certificates at all times, but for the next 3 weeks I’m going to offer a “Buy One, Get one Free Special.” That means, you can buy one gift certificate for $100 and get another one free. And it’s easy too. Just send me an email at chrismcwilliamsphotography@gmail.com with the particulars and I can get a customized gift certificate(s) ready for you. The best part is that you get to avoid the malls to do your shopping! I will be featured on Groupon on Sunday, April 21st and also featured with the Mother’s Day gift ideas. Tell your family and friends! The deal is the same as the last one, which I shared in my last newsletter. I will be available for sessions on Mother’s Day. Why not take the special mother in your life out for lunch and then come over for a surprise photo session? Email me at chrismcwilliamsphotography@gmail.com if you are interested. I am reducing the session free to $55.00 for this one day only. Don’t miss a great opportunity to get some photos of your family! Are you looking for a gift for your mother for Mother’s Day? I know that as a mother, the gift that I would treasure the most is a photo of my family. Last summer, my son and his family were here from Calgary and the rest of the family came over. With the help of a tripod, I was able to get a picture of all 4 generations of my family. I love this photo and know that I will treasure it for years to come. I also managed to get one of myself with my 2 sons and my grandson. Nothing makes me happier than photographs that mark a time in my life with the people who mean the most to me. 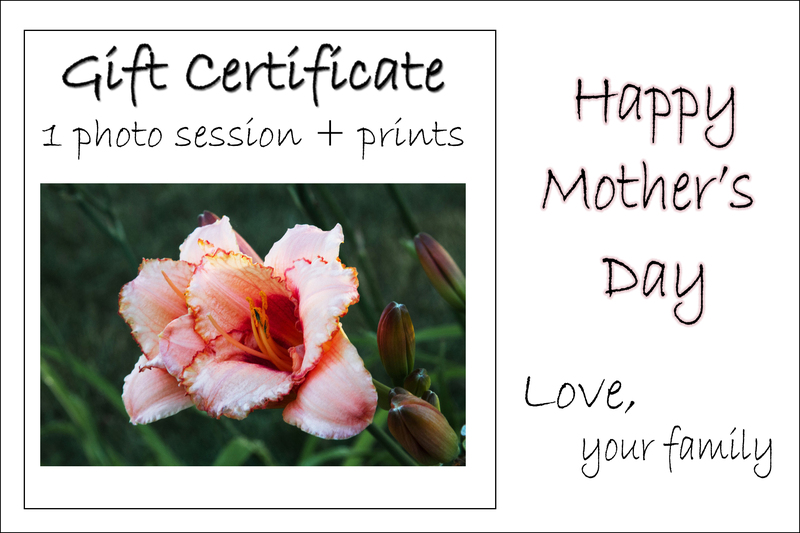 So if you are looking for a gift for your mom, why not buy her a gift certificate for a photo session?Put the gift certificate in a nice frame and wrap it up with pretty paper and a ribbon. I know your mother will be thrilled. And to make it even easier for you, I have a Groupon right now that will save you some money. If you are buying the Groupon as a gift, I can print a special gift certificate for you to frame. To purchase the Groupon, go to http://www.groupon.com/users/chris-mcwilliams-photography/deals/chris-mcwilliams-photography. For one week only; I am having a sale on gift certificates. You can purchase a session for someone and buy them an 8×10 print from the session for only $79. The regular price for this is $155. Don’t delay. This offer is good for one week only. Are you finished your Christmas shopping.? How about a gift certificate for that hard to buy for person on your list? For a limited time I am offering gift certificates at a 25% savings, which means that a $100 gift certificate will only cost you $75.00. I think it’s the perfect gift for anyone who has children and may not want to spend the money on a photo shoot. Give me a call if you are interested. This special is available until Christmas.